A generous lot of us is aware of Japanese culture through anime and manga. But for those who don’t prefer being couch potatoes, sushi is the only way to get exposed to the richness of this UNESCO recognised culture. Sushi, a popular Japanese delicacy, has come a long way when it was first commercialised in the year 1799. Ever since, the dish has only grown to become one of the most popular oriental dishes in the world. Sushi is vinegared rice, seasoned with salt and sugar. Yep, it’s that simple. Rice vinegar, made from fermented rice is used to flavour the sushi rice for its distinct taste. The best thing about sushi is that it can be combined with any ingredient and it can taste just as delicious. Sashimi and Sushi are often confused with each other. While sushi refers to just vinegared rice, Sashimi is also only referring to meat, most times sliced. This doesn’t necessarily need to be fish. Which means that you can also have chicken sashimi and vegetable sashimi like Konnyaku Sashimi. But more often than not, sashimi is only referred to raw meat. Thanks to being born centuries ago, today, sushi is available in large varieties. Besides the traditional Japanese varieties, western cuisine and other influences have created many new forms of sushi that appeal to different palates, but this is for another time. There are quite a few Japanese sushi to focus on already. Yes, that’s zushi, not sushi. When combined with another word, sushi becomes zushi. Nigirizushi is created by the simple method of squeezing together sushi rice with other ingredients and topped with a slice of raw fish. As the meat is combined with the sushi, the dish becomes more of a sushi than sashimi. Like nigirizushi, makizushi is also a simple dish. Flavoured sushi rice is spread over a thin sheet of nori (seaweed), lines with ingredients in the centre, and then rolled. Most times, the wrapping is seaweed, but innovation has led to the usage of soy paper, perilla leaves, omelette, and many more. Aburaage is also used to wrap sushi. Thin slices of tofu are deep fried in oil, not once, but twice and this becomes aburaage. This is often sweetened, giving inarizushi a unique flavour. If you like your food in a bowl, then here’s the perfect sushi for you. 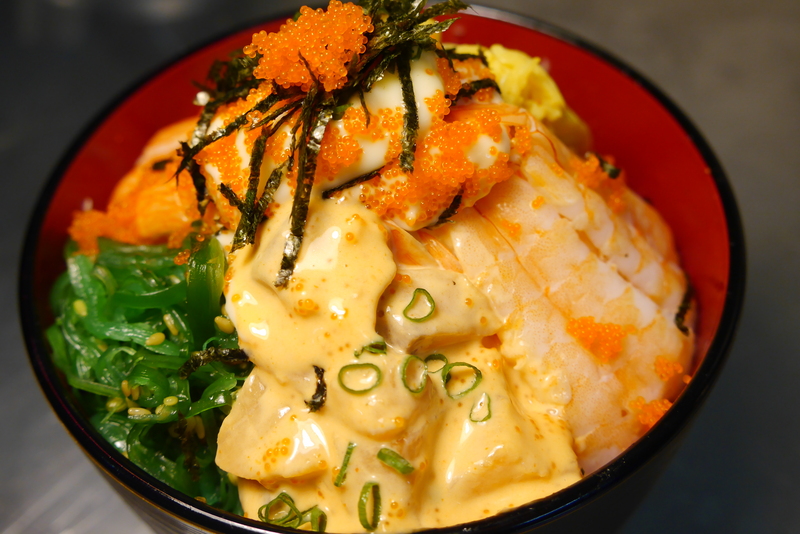 Chirashi zushi usually has a bed of vinegared rice topped with sashimi or other ingredients. In Japanese homes these ingredients used include fish cakes, egg, and, lotus roots. They can also have carrots, beans, avocado, codfish, and any other food that can go well with sushi rice. This is just like Nigirizushi, sushi is squeezed together with other ingredients. However, instead of hand squeezing, the sushi and other ingredients are pressed together in a box mold. This is also known as Hakozushi. The sushi comes out as a firm rectangular cake which is sliced into smaller pieces and served. Sushi dishes are usually seasoned with soy sauce, pickled ginger , daikon and wasabi sauce (a paste made from a local plant of the horseradish family), etc. Feel like trying some sushi right now? Login to Swiggy and order your favorite Sushi dish from one of the Japanese Restaurants in your neighborhood.